St Louis Leather Furniture Store - Peerless Furniture is your favorite of the St Louis leather furniture stores. They have a number of luxurious leather sofas, leather chairs and other pieces to fill your home with warmth and class. At Peerless furniture we strive to bring only the best leather furniture to each of our customers. Whether you reside across the river in St. Louis MO or here in Fairview Heights IL you will find the perfect pieces for your home. Customers from Fairview Heights, IL; Belleville, IL; Edwardsville, IL; Collinsville, IL; Maryville, IL; and Alton, IL will agree that Peerless Furniture is the area’s number 1 leather furniture provider. When you shop in store or online you will find only the top brands of leather furniture. We offer brands such as Flexsteel, Natuzzi Editions, Fjords and Canadel. For more information on each of these brands contact a Peerless Furniture store team member today. Leather Sofas - When you visit Peerless furniture at our Fairview Heights location you will quickly note the excellence in each our products. We are particularly proud of our Leather sofas. We have countless satisfied customers willing to back our customer service but more so, our quality furniture including leather sofas. Our Flexsteel, Natuzzi, Fjords, and Canadel brands have entrusted us to carry their best inventory. We are well aware of the lasting impact a quality leather sofa can bring to a home. You are in the right place if high quality is what you’re looking for and spectacular craftsmanship speaks to you. Leather Chairs - What is a leather sofa without a complimentary leather chair? Well, not much really. At Peerless Furniture you will find the most complimentary leather chairs around. While each of our leather sofas makes quite a statement it is our leather chairs that sometimes steal the show. Each of the leather chairs sold at Peerless furniture is of supreme quality and craftsmanship. These chairs were made to last a lifetime. You can easily match a Natuzzi leather chair with a correlating Natuzzi sofa; or a Flexsteel leather chair with its Flexsteel counterpart sofa. However, feel free to have a little fun and mix and match between each of our brands. Mix a Canadel sofa with a Flexsteel leather chair; or mix a Fjords leather sofa with a one-of-a-kind Natuzzi Editions leather chair. Find the chair that speaks to you and there’s no doubt that it will compliment your favorite sofa set. 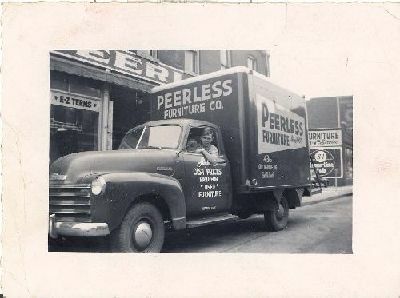 Shop Peerless Furniture conveniently located near St. Louis, MO and Belleville, IL for all of your home furniture needs. A Peerless Furniture leather sofa and complimentary leather chair will leave a lasting impression in your home for generations to come. You can also check out our St. Louis Leather Furniture blog here.